Can I Add A Photo To My T-Shirt Quilt? T-Shirt quilts are like billboards. They tell everyone what you like to do, where you've been or even where you're going. 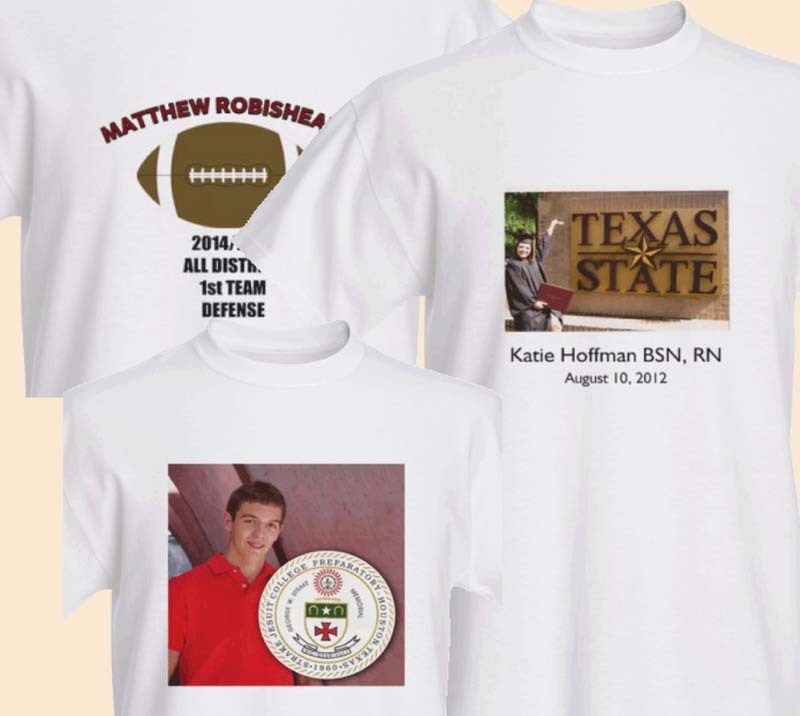 Photos on t-shirts are just that extra special sauce to make your memory or t-shirt quilt awesome! All you need to do is choose the digital photo you want to include in your quilt. If it is a document or old photo, just scan the image in at a super high resolution, and save it as a file. You will upload the file to one of many online t-shirt maker. Lots of these places have templates, fonts and layouts to make this very easy. second image on the back of the t-shirt! This is a series of tee shirts that we had printed for customers. The first one was just some info the mom sent, we added the football and the name. Perfect block! The second picture was scanned in from a professionally printed photo. Easy to add the graduates name and date. The last picture was a combination of a graduation picture and school logo. We are not in the business of printing photos on T-shirts. And, in the past we actually did print directly on prepared fabric. We then had to add fabric around the photo to make it large enough to fit the quilt block. Over the years, we have found that the images printed with an inkjet printer on fabric just do not last like the product indicates on the instructions. You can purchase tee-shirt transfer product to print at home. You print on a paper backed film product, and heat transfer the image to the t-shirt. All kinds of issues with this. The film can peal away from the fabric after being laundered a few times. Again, since we don't control the application process, we do not encourage this method, and recommend that you have the tee shirts professionally printed. The cost is minimal, and you'll be pleased with the final product. The elephant artwork on the right was created by a young boy that passed away too soon. We put his art on a t-shirt and featured it in the center of each of the memory quilts made from his clothing. We suggest that you use a company like VistaPrint, CustomInk, Walgreens or any other company that prints photos. Recently, we started using online services to print photos on t-shirts. 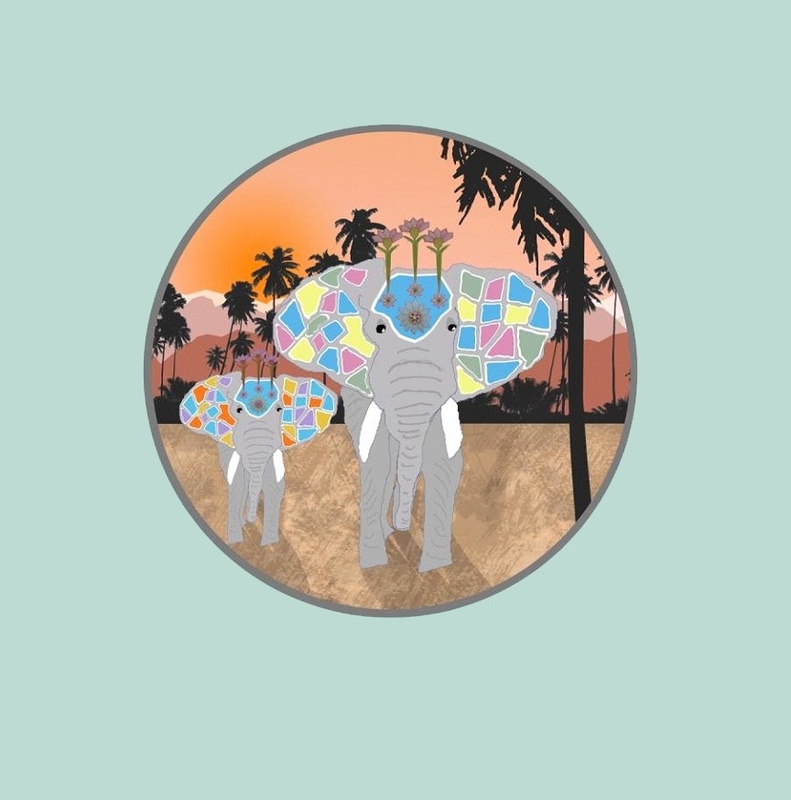 We think this gives you a more professional finished image that you will blend in with the rest of your t-shirts, making your quilt last a lifetime. Our logo image was printed on a t-shirt from CustomInk as we wanted the orange t-shirt. VistaPrint has a limited number of tee shirt colors but is a good value. You can order the tee shirts and have them shipped directly to us, or order ahead of time and include with the other tee shirts. If you prefer, we can have them printed for you for a small fee.